Last Summer I discovered two things, the first was that I could wear flip flops, after years of thinking that they were too uncomfortable. The second thing was that I didn't actually want to wear any old flip flops, I just wanted to wear Fitflops! Fitflop have been around for over six years now and have expanded their range, from their original Fitflop sandals greatly to include mules, shoes and boots. 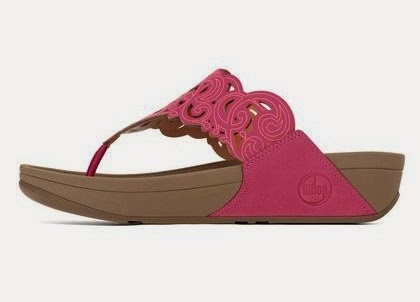 I have a pair of the Lulu range of sandals which I wore all through last Summer and I'm looking forward to walking around in comfort again in this Summer. All Fitflops contain their unique ergonomic, super-cushioned midsole technology.These 'microwobbleboard midsoles' help to diffuse underfoot pressure which makes them super comfortable to wear. I have genuinely never had a pair of sandals which have been so comfortable. When Fitflop got in touch to offer me the opportunity to give away a pair of their shoes to one of my readers I was delighted to do so. I was invited to choose a pair of Fitflops to give away and, as I've fallen a little in love with their Flora sandals I chose those. They are available in five different colours - black, ultra orange, tan, rio pink and urban white - and feature laser cut leather uppers which were inspired by Brazilian carnival costumes. These shoes are going to be perfect for a Summer which will see all eyes on Brazil when they host the FIFA World Cup. In order to have the chance to win these fantastic Flora sandals in the colour of your choice simply complete the Rafflecopter widget below. The blog post comment is compulsory and completion of this will unlock a variety of additional entries. Please read the terms and conditions. Good luck!